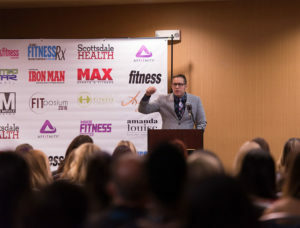 On October 1, 2016, I attended my very first FITposium conference. I was overwhelmed with excitement of traveling to Phoenix, meeting so many talented and beautiful like-minded individuals and learning from the elite in the fitness industry on what it truly takes to launch a fitness business and make a name for yourself. Beyond meeting some of my favorite fitness inspirations and making new connections, there was a valuable lesson that I had learned that weekend. For years, I have flipped through fitness magazines such as Oxygen, Women’s Health and Fitness, and Muscle and Fitness Hers in admiration of the sculpted, inspirational fitness models. Each subscription in the mail felt like Christmas because new workouts and nutrition research would be published. I knew from an early age I wanted to be a part of something just like that; and here I was in the presence of men and women just like me who have accomplished such things. As I sat in my chair on the final day of FITposium 2016, I felt a strong feeling of regret. Regret that I had not taken the risk that could have lead me to my ultimate dream. Knowing whole-heartedly that I did not prepare for a chance in a lifetime and making a conscious choice to bypass auditioning for a magazine cover with Max Sports & Fitness Magazine. I did not give it my all. I can tell you nothing is worse than the feeling of regret, especially when matters are in your control. One very important lesson I have learned is that opportunities will not always come twice. We must live as if we only have one chance, and that that day could come at any given moment. Fear and lack of self-belief kept me from experiencing FITposium to the fullest, and has taught me the value of time and hard work. If you have a vision, I encourage you to hold it close and believe in yourself. Learn and grow until it comes to pass, and don’t forget to thank those who have helped you along the way. FITposium is an excellent resource for fitness talents and entrepreneurs. The people you meet feel like a fitness family, and will support your journey and accomplishments. If you are lucky, it may teach you a life altering lesson like it had done for me. Are your actions today getting you closer to where you want to be tomorrow?